The latest YouGov Smartphone Mobile Internet Experience study shows that Nokia continues to lose market share to newer brands such as Apple and HTC. The Finnish mobile giant is failing to compete, with the numbers of smartphone owners planning on opting for a Nokia as their next mobile dropping substantially over the last six months. "Only a third (34 per cent) of respondents will consider getting a Nokia next time, a drop of 12 per cent since December 2009 and the number of those who expect to actually purchase a Nokia has also fallen," notes YouGov's smartphone study. 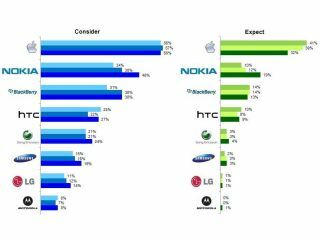 "Only 10 per cent of respondents expect their next handset purchase will be Nokia, compared to one fifth in December 2009. This is in contrast to 41 per cent of smartphone owners who expect to get an Apple handset next time." The latest figures are from the third of four quarterly-year market research studies by YouGov, with the organisation having interviewed 2,121 smartphone users between 4 and 7 June 2010 on behalf of a number of clients, including major UK mobile network operators. Reasons given by participants in the study for the shift away from Nokia as a desired smartphone including wanting a change of brand, a lack of available apps and perceived poor quality of the operating system. Far fewer people are also now likely to recommend Nokia as a brand to friends or colleagues. YouGov's survey shows how Nokia's recommend score has slipped by 15 per cent in six months to just 12 per cent, compared with Apple's recommendation score of 70 per cent for its iPhone brand. Russell Feldman, Research Manager in YouGov's technology and telecoms team says of the results of the latest study: "Where Nokia once led the market, it has drastically fallen by the wayside. Its OVI store continues to be significantly outperformed by both Apple's Apps store and Android Marketplace. "The results of our data consistently show that the market leader is fast becoming an also ran in the smartphone market. New products, software and apps are needed soon if Nokia is to keep up with its rivals."